Financial statements represent the main source used for the study of a company’s progress and development. Since the founding of Assicurazioni Generali Austro-Italiche, the standards for drafting and verifying the financial statements are governed by the first statute (defined as the “social contract“, chapter VII, articles 40-41), dated December 26, 1831. For the years 1832 and 1833, two “notice” statements are conserved, which result as the only ones of this kind ever produced. These constitute a sort of preview of the results (income statement), prior to the publication of the first and second official statements relative to the same years, since these were divulged only in 1834 and 1835. 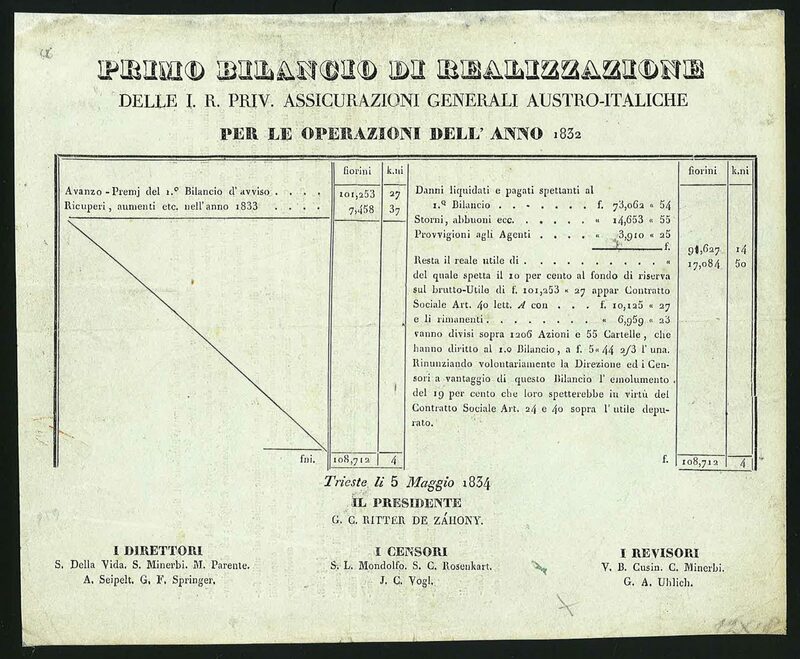 Pietro Brunelli was assigned to the drafting of the first “notice income statement”, as indicated in the Management report dated February 19, 1833, where he is referred to as the “holder of the books”: in fact, he was the first Head of Accounting, and drafter of the financial statements. In the corporate bylaws from March 1832, the central structure of this department was described as: the first section of the “bureau” is defined as “Accounting and Registries”, Samuele Minerbi is the Head of the portfolio and Antonio Seipelt is the head of the treasury and records, while Pietro Brunelli is responsible for keeping the accounting books (first entries, journal, general ledger, table registry of transport and fire insurance contracts, register of shareholders and share certificates, T-account books) and has the responsibility of extracting six-month accounts; the copy clerk is Giuseppe Levi. 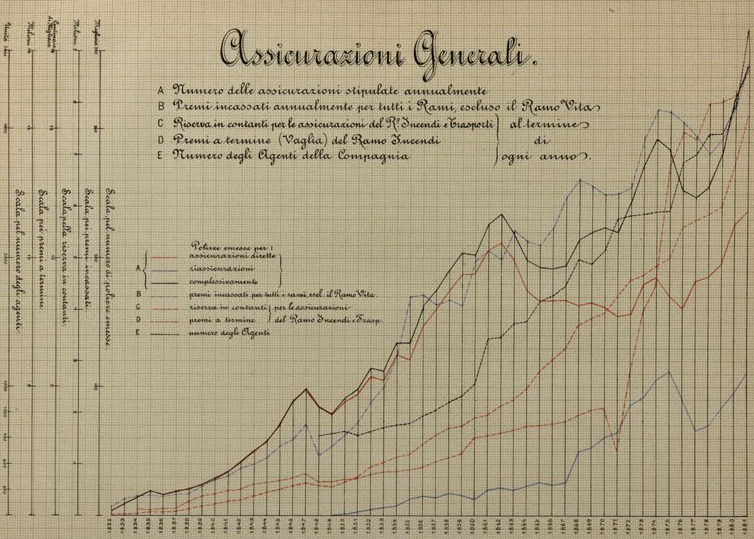 The first “real” financial statement (defined as “of achievements”, but still a simple income statement) was published on May 5, 1834, with the comprehensive data from only the transport and fire branches, while the life branch would not be accounted until more appreciable objectives were met. The profits were 17,084.50 Florins, considered not very positive due to losses, in particular in the maritime transport branch. The document consists of a simple small size sheet with the opposite side reporting the text of the statement read by the Management in the Shareholders’ Meeting. Over the course of time this progressed to more and more articulated reporting, with changes based on internal needs, due to Company growth, as well as based on regulatory requirements for the drafting and publication of the financial statements. The Management report, regularly presented at the start of every statement, described the major events of the previous year to the shareholders. In addition to illustrating the results of transactions from various branches, it often also contained news reflecting general historic events, or those more closely linked to the Company. 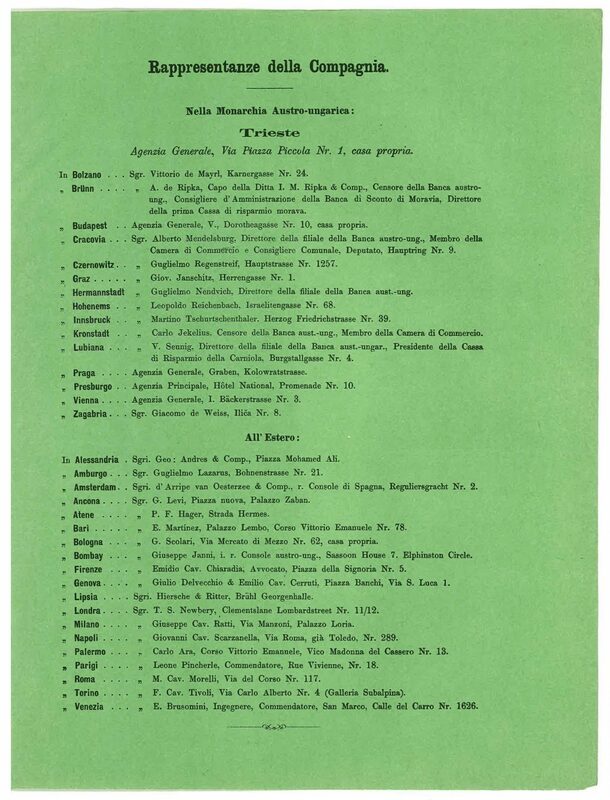 There are mentions of the fire in the La Fenice theatre in Venice in 1836, the political events and war between 1848 and 1849 that prevented regular publication of the financial statements, a circumstance that would be repeated in 1866 following the third war for Italian independence. This resulted in the passage of Veneto – and therefore also the Venetian Head Office – to the Kingdom of Italy (on these events, please see Generaly in History. Tales from the Archive. Nineteenth Century, published by Marsilio in 2016). News of this kind could be accompanied by announcement of the deaths of important figures in the Company top management, the activation of new branches, the opening of new offices or the founding of subsidiary companies, in addition to perspectives on future developments. The first (income) statement from the life branch appeared in 1837 and referred to the first five years of the branch, while in the following year the non-life branch was referred to as statement “A” and the life branch as statement “B”. Reports by auditors and censors were also added (1850), along with the list of owned shares (1871). The first financial statements in a bound book were produced for the 1875 fiscal year, and provided more detailed information about the single branches in statement “A”; the 1877 edition reported the corporate representation for the first time with annexes illustrating the diverse businesses of the life branch becoming more and more significant, and two years later the list of main offices was inserted, subdivided according to the territories of the Habsburg monarchy and areas abroad. Starting with the 1894 fiscal year, real estate properties were listed under a single heading; from 1896 the share capital value was listed on the cover, with guarantee funds, capital derived from life policies, pay-outs over the course of the year and totals since the founding of the Company. The Company produced special editions for the occasion of Jubilee Years. For the fiftieth financial statements in 1882, the social contract, the list of first shareholders, the first income statement, and some demonstrative corporate development graphs were reprinted; a chronological time-line of corporate representation was inserted for the seventy-fifth year of the Company in 1906. Currency also changed over time, reflecting the monetary fluctuations in the Habsburg Empire. Up until November 1858, the so-called “conventional” Florin” was in use, then replaced by the “Austrian” Florin (in the financial statements , often indicated with the abbreviation “V.A.”). In 1892 the Crown became the official currency with an exchange rate of two Crowns for one Florin, but this variation was effectively implemented only after several years, in the statements for the 1897 fiscal year. In the Management report dated January 27, 1898, drafting of the financial statements converted to the new currency was deliberated, with conversion of accounting entries and all other Company activities into Crowns. Financial statements were also published in other languages and other currencies: an edition in German parallel to the Italian version was published in the territories of the Empire in Florins; one in Italian Lire starting from the 1867 fiscal year, the first after the previously recorded annexation of Veneto to Italy; there were also versions in other European languages and currencies, including French Francs, German Marks, Hungarian Forints, British Sterling and Spanish Pesetas.